In Britain’s referendum on whether or not to stay in the European Union, the Leave campaign plays strongest in places like the one my family came from, Great Yarmouth, in the far eastern corner of England. This referendum campaign has lined up on the Remain side almost the entire political establishment, business, economists, institutions, and expert opinion on everything from trade to migration. The Remain position is that to vote to leave is an act of economic and political self-harm. I was born in Great Yarmouth – actually, in Cobholm – in a two-up, two-down that my grandparents rented from the local council. My grandparents are long dead, but the house is still there. I visited last year. This is what half a century of economic progress looks like in Cobholm: the metal-framed windows are now PVC; the coal fire has become a gas heater; milk delivery has stopped; the chip shop, Co-op and a couple of pubs have shut down. Mobile phone coverage is weak. Cobholm ranks among the 7% most deprived communities in Britain. But then Great Yarmouth is poor. In 2010, nearly half its households had an income under £20K (compared to less than a third in England). We know from pollsters that people who are older, less educated, and poorer are more likely to vote Leave. 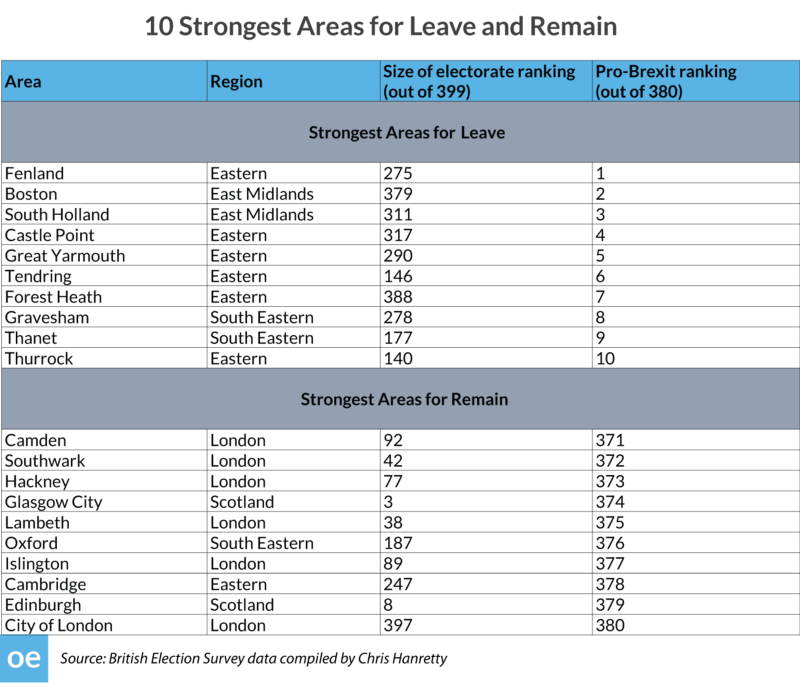 So how does Great Yarmouth , a coastal town in the middle of the Leave strongholds below, compare to Lambeth , a London borough in the middle of the Remain redoubts? Great Yarmouth scores high on poverty. Of England’s 326 local authorities, it ranked 20th most deprived. Lambeth has deprivation too – it ranked 29th. Great Yarmouth is old. Nearly one in four of its people is aged 65 or over. In Lambeth it’s one in twelve. Fewer than one in five of Great Yarmouth’s people have a university degree or similar, compared to nearly half of those in Lambeth. Lambeth is twenty times more densely populated than Great Yarmouth. Nine out of ten people in Great Yarmouth are what surveys call ‘White British’. In Lambeth it’s just four out of ten. Deprivation? Age? Education? Identity? Or is it all those things? Would you be angry with half a century of politics that has seen the place in which you live gently rot? Where governments and parliaments have come and gone with little to show for it except a bypass? What more harm can be done? Wouldn’t you put pride and patriotism ahead of pounds in your pocket? This is where the referendum will be won or lost. And it isn’t difficult to see what might have turned Great Yarmouth from angry Leavers to acquiescent Remainers. Double the educated population. Bring in more young people. Tackle poverty and seasonal, low-paid jobs. Make it more cosmopolitan. None of these things are doable with the wave of a magic wand, but neither are they mysterious. But Great Yarmouth is a place used to being ignored and forgotten, a place the referendum’s winners or losers will likely continue ignoring and forgetting for another half century to come.